holder for paper background in a roll with a plastic chain and a weightmakes it easy to wind up the ..
Prenosna studijska torba za prenašanje studijske opreme (bliskavice, pripomočki, ...)- Nudi optimaln.. Camera bag for almost all DSLR cameras (eg Canon EOS 550D + 18-55mm lens)high quality, waterproof ma.. Very large photo bag The bag and the compartments are upholstered Additional fasteners for stands Ma..
Henzo Photo album "Jessy". Book Album.Photos are precious memories of special moments. These me..
cool handlebar bag for your bicyclefor secure and water-tight transport of your photo equipmentwith .. 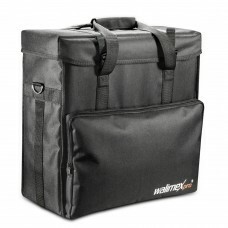 Spacious studio bag for transporting and storing the Mover 400 TTL and accessoriesSturdy padding to ..
Plug-in flash tubeCompatible with Walimex pro Mover 400 TTL studio battery-powered flashPower consum..